I came across this excellent article on Medium. It reflects on the ways women are harassed and why standing up to sexual harassment can actually be a dangerous for them. Last night, I watched the movie Spotlight for the first time. It was such an emotional rollercoaster and it left me absolutely furious at the ways I have seen the exact same situations in the Protestant church. I want to share a quote from the movie that broke my heart. If you haven’t seen it yet, it is now on Bluray and DVD and you need to see it immediately. Warning: This movie will likely evoke strong emotion and may be triggering to some. I was an emotional wreck while watching it. Bring your Kleenex. A college friend of mine, Michael Stark, has launched a new blog project, Inviting Liberation. Here is his most recent post, a powerful reflection on methods of subtle exclusion within Christianity. My friend Jory Micah (you may have heard of her), has been on a role recently. She wrote excellent posts on both Mark Driscoll and Kevin DeYoung exposing the ways in which they have twisted Scripture and used it to silence and oppress women. Julie Rodgers has written a damning post discussing her treatment as an LGTBQ+ staff member at Wheaton College. There seems to be a trend with the way minorities are treated at Wheaton. On February 20, Mark Driscoll was invited to speak at the flagship chuch for the Northwest Region of Acts 29, Grace City Church. It was a trainwreck in so many ways, especially when a pastor from the church admitted Driscoll had been involved “behind the scenes” with the church and its leadership. Take a listen (and if you’re interested here is my response). 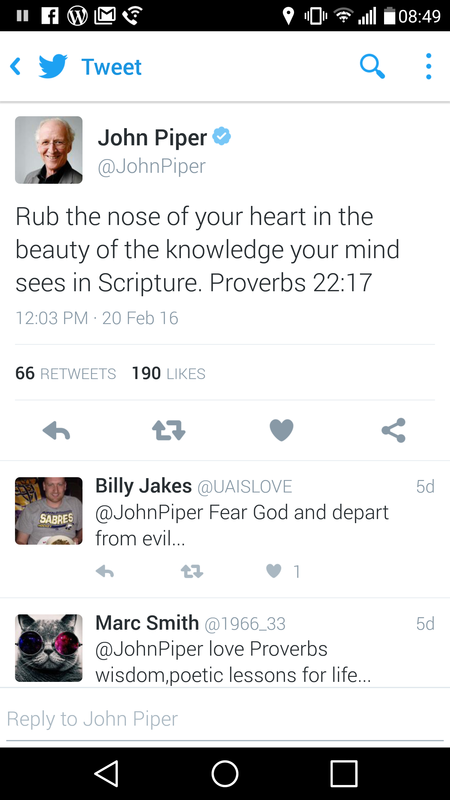 John Piper had another weird Twitter moment this week. If anyone has any clue what this tweet means, please feel free to expound. All I can think is that Piper might need an Anatomy refresher course. Hope this finds everyone having had a great week.